The United States relies heavily on the individual income tax, at 37 percent of total government revenue. On average, OECD countries collect little from the corporation income tax (8 percent of total government revenue). A country may decide to have a lower corporate income tax to attract investment (as many have), which may reduce their reliance on corporate income tax revenue and increase reliance on social insurance taxes or consumption taxes. For example, Estonia only raises 3.8 percent of total revenue from corporate income taxes but makes it up by raising a combined 77.5 percent of total revenue from social insurance taxes and consumption taxes. Countries may also be situated on natural resources that allow them rely heavily on taxes on related economic activity. Norway, for example, has a substantial oil production industry on which it levies a high (78 percent) income tax and thus raises a significant amount of corporate income tax revenue. These policy and economic differences between OECD countries have created differences in how they raise tax revenue. According to the most recent data from the OECD (2011), consumption taxes are the largest source of tax revenue for OECD countries. On average, countries raise approximately 33 percent of their tax revenue from consumption taxes. This is unsurprising given that all OECD countries (except the United States) levy value added taxes at relatively high rates. The next significant source of tax revenue is social insurance taxes. OECD countries raised approximately 26 percent of total revenue from social insurance taxes. 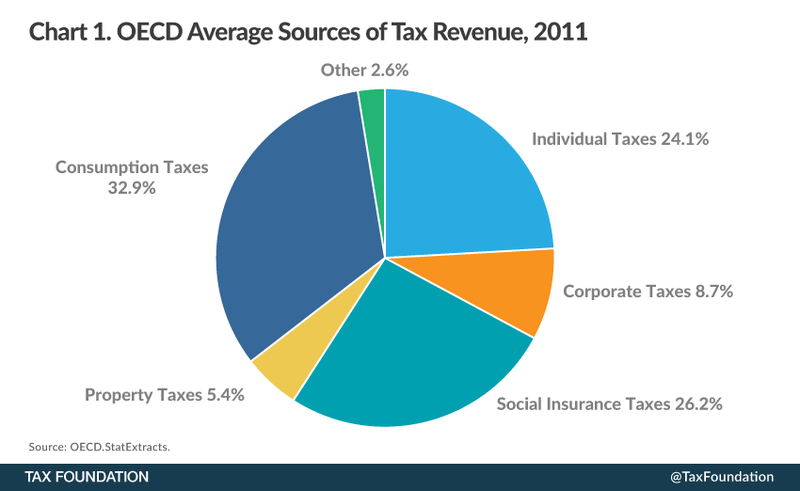 Individual income taxes accounted for 24 percent of total revenue across the OECD. 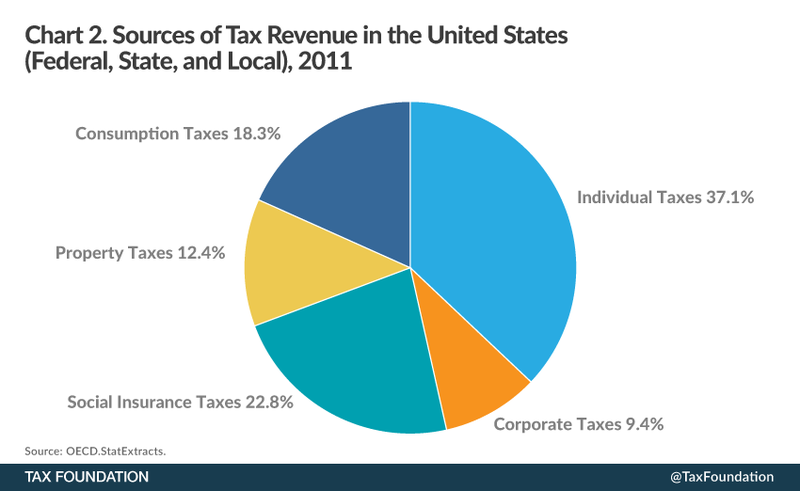 Corporate income taxes accounted for only 9 percent of total revenue. Property taxes raised the least across the OECD, accounting for only 5 percent of total revenue. 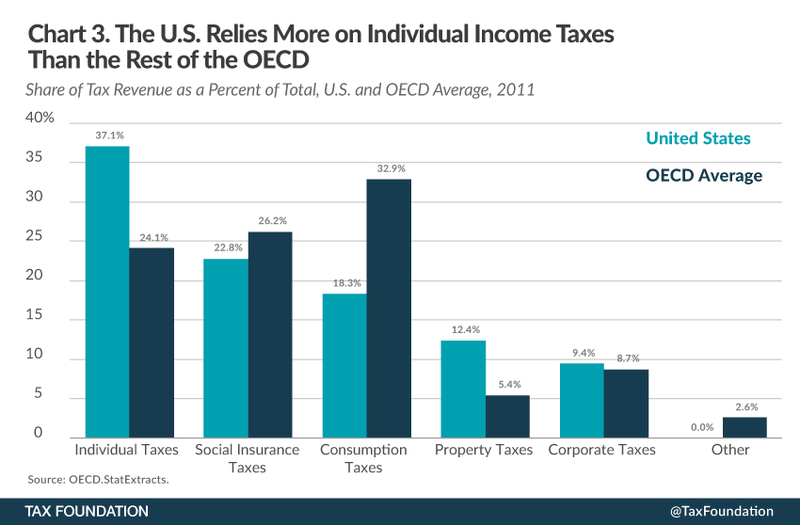 The United States relies the most on individual income taxes. According to OECD data, the United States (federal, state, and local combined) raised approximately 37 percent of all tax revenue from individual income taxes, compared to the 24.1 percent among all OECD countries. Social insurance taxes make up the second largest source of government revenue in the United States at 23 percent of total. The United States relies much less on taxes on goods and services than other OECD countries. In 2011, the United States raised 18 percent of its total tax revenue from taxes on goods and services, compared to the 33 percent average among OECD countries. The smallest source of tax revenue is the corporate income tax. Federal, state, and local governments collected approximately 10 percent of total tax revenue from corporate income in 2011. This is slightly higher than the OECD average of 9 percent. Consumption taxes are taxes on goods and services. These can take the form of excise taxes, value added taxes (VATs), and retail sales taxes. Most OECD countries levy consumption taxes through VATs and excise taxes. The United States is the only country in the OECD with no VAT. Instead, most state governments apply a retail sales tax on the final sale of a product and excise taxes on the production of goods such as cigarettes and alcohol. The United States raises the least amount of tax revenue from consumption taxes as a share of total revenue in the OECD at 18.3 percent. Japan raises slightly more at 18.4 percent, followed by Switzerland at 22.3 percent. 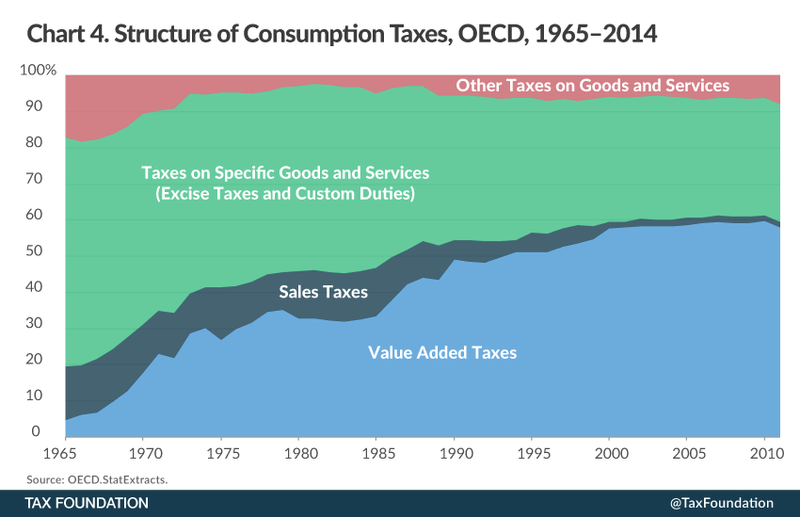 The structure of consumption taxes in the OECD has drastically changed over time. In 1965 (the earliest year of data available), 78 percent of all revenue from consumption taxes were from excise taxes, customs duties, and sales taxes. No country had a truly broad-based value added tax. Only France levied a VAT on a limited basis. The OECD on average only raised approximately 4.6 percent of total consumption tax revenue from the VAT. In the 1970s and 1980s, countries started replacing sales taxes, excise taxes, and custom duties with the VAT, which was seen as an improvement due to its export neutrality and exemption of business-to-business transactions. As countries throughout Europe and the rest of the OECD adopted the VAT, reliance on its revenue steadily grew. By 2011, it accounted for 49.7 percent of total consumption tax revenue across the OECD. In contrast, tax revenue from excise taxes and customs duties declined to 27 percent of total consumption tax revenues. Chile, where social security is largely privatized, raises the least at 6.3 percent. Australia and New Zealand are the only two countries that do not levy specific social insurance taxes on workers to fund government programs. The Slovak Republic (8.8 percent), Czech Republic (10.7 percent), and Hungary (13.2 percent) raised the least amount of revenue from individual income taxes. Hungary (3.3 percent), Estonia (3.8 percent), and Slovenia (4.6 percent) rely the least on the corporate income tax. Estonia relies the least on property taxes, raising only 1 percent of its total revenue with them. Austria (1.2 percent of total revenue) and the Slovak Republic (1.4 percent of total revenue) also rely very little on property taxes. In general, most OECD countries lean more on tax revenue from social insurance taxes and consumption taxes than other types of taxes. The United States, in contrast, relies more on individual income taxes while raising relatively little from consumption taxes. This policy difference matters when you consider that consumption taxes raise revenue with less economic damage than individual income taxes. (1) OECD does not distinguish between subcategories. From 1982 to 2014, the average top marginal corporate income tax rate in the OECD has declined from around 48 percent to around 25 percent. See OECD Tax Database, Table II.1, http://www.oecd.org/ctp/tax-policy/Table%20II.1-May-2014.xlsx. Ernst & Young, 2014 Global oil and gas tax guide, http://www.ey.com/GL/en/Services/Tax/Global-oil-and-gas-tax-guide—Country-list. Organization for Economic Cooperation and Development, OECD.StatExtracts, OECD 2014, http://stats.oecd.org/. 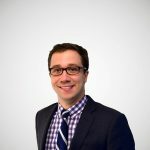 Kathryn James, Exploring the Origins and Global Rise of VAT, Tax Analysts (2011), http://www.taxanalysts.com/www/freefiles.nsf/Files/JAMES-2.pdf/$file/JAMES-2.pdf. Adoption of a value added tax is a condition for accession to the European Union.